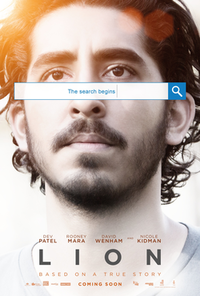 Lion is a 2016 biographical drama film directed by Garth Davis (in his feature debut) and written by Luke Davies, based on the non-fiction book A Long Way Home by Saroo Brierley. The film stars Dev Patel, Sunny Pawar, Rooney Mara, David Wenham and Nicole Kidman, and tells the true story of how Brierley, 25 years after being separated from his family in Burhanpur, sets out to find them. The film, which had its world premiere at the Toronto International Film Festival on 10 September 2016, was given a limited release in the United States on 25 November 2016, by the Weinstein Company before opening generally on 6 January 2017. It was released in Australia on 19 January 2017 and in the United Kingdom on 20 January 2017. This webpage uses material from the Wikipedia article "Lion_%282016_film%29" and is licensed under the GNU Free Documentation License. Reality TV World is not responsible for any errors or omissions the Wikipedia article may contain.